The main plank of an inbound marketing strategy is content. However, before you actually create content or revise existing content, you need to have a clear idea of your strategy’s goals. Essentially, this marketing strategy allows customers to visit your website and learn about the products or services before being classified as probable and viable leads that the sales department should approach. This will help improve the bottom line of the company, as the prospect is already well-informed about the product or services and is more likely to complete the purchase. You can improve your inbound marketing strategy by implementing the following steps. The first step toward a successful inbound marketing strategy is determining the persona of your target customer. The persona should be a complete profile and include all possible details such as age, gender, professional qualifications, educational background, hobbies, interests, personal life and other details that are relevant. To obtain this picture you need to involve various stakeholders from the company such as sales executives, customer-service representatives and others. The persona should include information about both the likes and the dislikes of the target customer. The information should also include the financial profile of the persona such as their income, expenses and attitude toward money. For instance, if the persona is an executive with a business goal and allocated expenses for it, this information should be available to the content creator. On the other hand, if the persona is a person with limited income, this information will be helpful in creating the content. Next, you need to have a clear understanding of the brand or product you are marketing. You need to have a complete idea of its functions, nuances and characteristics. You need to know if it is a luxury product or one that is meant to save money. This information will help set the tone for the content and ensure that it resonates with the persona. For instance, a fashion brand needs to be marketed differently from a gadget that will help a student save money. If you already have a website, Facebook page, Twitter account and blog, analyze the existing content to ensure that it accurately depicts the brand or product and will appeal to the persona you are targeting. If not, your first priority will be rewriting this content or changing it to reflect the new marketing strategy. This will ensure that all the media that carry your marketing material convey a consistent image in line with your marketing objectives. 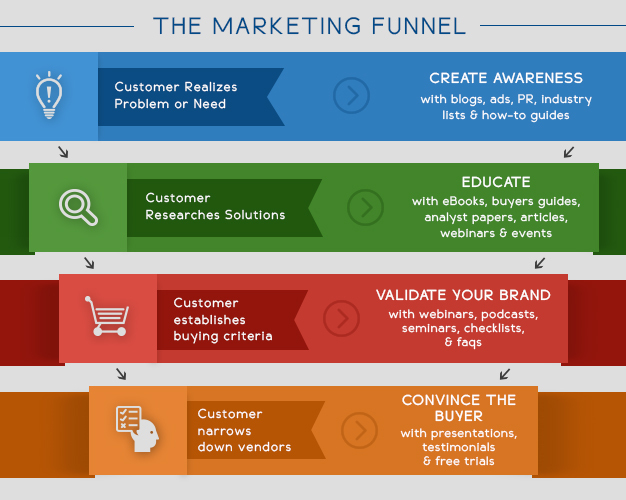 There are various stages in the marketing cycle or marketing funnel. You need to have content that will appeal to the persona as they enter the various stages of the funnel. In the first stage, the persona is aware of a problem and is looking for general information about it. Content created for this stage should be available in blogs, how-to articles, industry papers and press releases. The material should not be sales oriented, but rather should discuss the problem and potential solutions without being biased toward your company’s products. The aim here should be to build yourself as an authority figure rather than as a salesperson. In the second stage, the persona begins to understand the problem better and starts researching solutions. At this stage you need to provide content in the form of white papers, e-books, analyst papers, independent articles and so on. The content should continue to be informative and educational without having a sales pitch. The aim is to continue to build your reputation as an authority figure. In the third stage, the persona will be able to decide their purchasing criteria and formulate a list of must-have and nice-to-have features. They will have a better idea of what they are looking for from the product they will be purchasing. Content for this stage should include checklists, industry norms, questions they need to ask and so on. The fourth or final stage of the marketing funnel will take the persona to the prospective sales stage. They will be ready to evaluate vendors. They have probably shortlisted a couple of vendors and have a terrific and poignant idea of what they are looking for. They are educated about the product you are selling as well as their needs. This makes them better sales prospects since they require less time for convincing. Content at this stage should include product descriptions and call-to-action pages. Once you have the marketing cycle and potential content list ready, you need to determine which media you will use for specific types of content. For instance, press releases should be part of the main website, whereas independent articles can be contributed to article directories. Have a site map that allows you to know the exact places where new content is going to appear. Before you actually start creating content you need to have a list of keywords that will be used in the various types of content that will be created. To determine the keyword list, look at what phrases your existing browsers and customers use, the words your competitors are using and words that best describe your product or unique selling point. You also need to have clear guidelines for the use of keywords in various types of content that you are creating. Ensuring that white papers remain authoritative by using a negligible number of keywords will also ensure that search engines rank them higher. Now you are ready to create content that will be of use to your inbound marketing campaign. Use the map you have developed to create content appropriate for the various stages in the marketing funnel. At all times, you need to keep the persona you have developed in mind and write for them. This means that a white paper addressed to an industry professional should use words and language that will appeal to them, whereas a blog that is aimed at a teenager should use language and ideas that are appropriate for this type of audience. When you are planning an inbound marketing strategy, you need to schedule content creation to ensure that there are regular updates and posts that are relevant to the persona. Search engines are more likely to prioritize authoritative content that is fresh. This means that you need to schedule regular releases of fresh white papers, blog posts and press releases. Of course, the frequency of blog posts might need to be greater than that of white papers. Even product description pages should be changed to reflect new customer needs and aspirations. In order to maximize the impact of the inbound marketing strategy, you need to constantly monitor and review the effects of the content. Monitor social-media sites for opinions and comments. You also need to be proactive in removing content that gets negative feedback. You must regularly check that content continues to remain relevant. This is more important if the product you are marketing has seasonal appeal. In order to improve the marketing plan, you need to constantly measure the effect of the content. It is important to realize that just counting page views or time spent on the page is not sufficient. Instead, measure the likes, shares, comments and other interaction a page generates. Actual sales can only be measured for call-to-action pages. For other pages, this metric is not very relevant as their function is to build trust and authority, not generate sales immediately. An effective inbound marketing strategy can be a cost-effective way of increasing sales. However, in order to do this you need to have a clear definition of the target customer as well as a clear description and understanding of the product being sold. This is necessary to develop content that can be used to attract the attention of the persona or target customer through the various levels of the marketing funnel. In order to create relevant content for the persona, you need to have a very clear picture of the persona and the product. This will help the content creator envision the potential problems that someone can and will most likely experience which the product can solve.